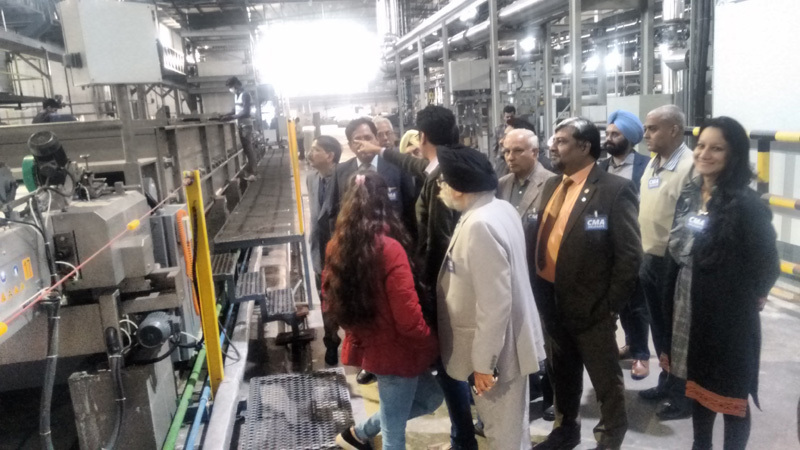 A delegation of members of Chandigarh Management Association visited Auro Textiles Unit-II of Vardhman Textiles Limited, Baddi (Himachal Pradesh) on 20 January 2018. This unit of Vardhman focusses on finishing and printing the grey cloth (woven cotton fabric in its loom-state). The grey cloth undergoes many physical and chemical treatments before it is developed to its full textile potential and receive a considerable added value by applying one or more finishing processes. The processes followed by Auro Textiles includes Singeing to burn off the surface fibres from the fabric to produce smoothness by passing the fabric over a plate heated by gas flames. The cloth is then steeped in a dilute acid/ enzyme and rinsed. Then comes the Scouring, the chemical washing with alkali solution (usually sodium hydroxide). Next step is Bleaching and then Mercerising. Here the fabric is treated with caustic soda solution to cause swelling of the fibres and to wash out all alkali. Finally the coloration process. Two processes are used to apply colour – Dyeing and Printing. The last process before packing is Shrinking, whereby the fabric is forced to shrink to minimal the subsequent shrinking while laundering. It was a mutually beneficial learning experience. CMA delegation also shared some of their expertise / experiences in the area of Human Resource, Chemical processing and Security & Safety with the company officials.